The Seonso Conglomerate (?Santonian – Campanian, Late Cretacous) of Boseong site 5 (southern coast of Korean Peninsula) has yielded well-preserved postcranial material belonging to a new taxon of ornithischian dinosaur, Koreanosaurus boseongensis nov. gen., nov. sp. 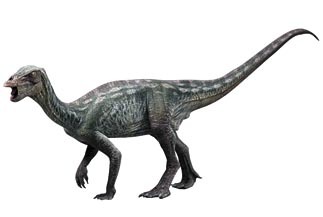 This dinosaur is characterized by elongated neck vertebrae, very long and massive scapulocoracoid and humerus, proportionally short hindlimbs with a low hindlimb ratio for tibia/femur, and anteroposteriorly-elongated femoral head forming an obtuse 135° angle with the femoral shaft. Koreano saurus displays a series of neornithischian synapomorphies. 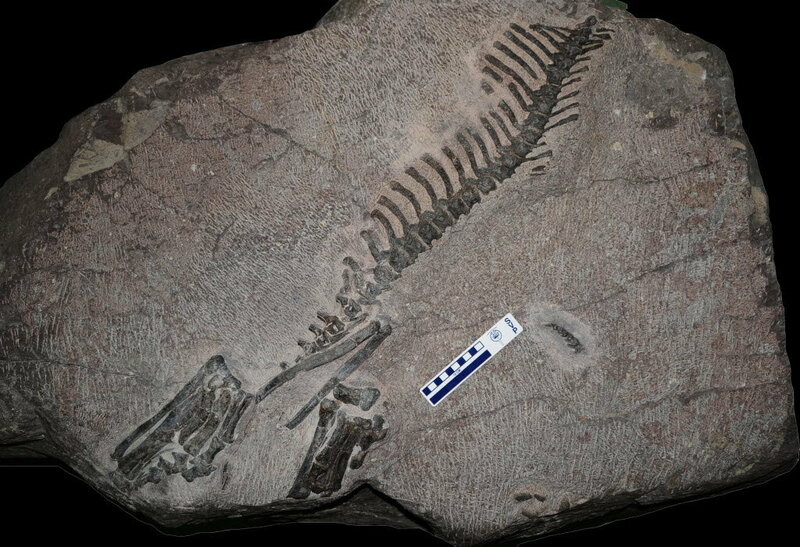 Amongst Neornithischia, most features of the postcranial skeleton suggest affinities with basal ornithopods and, amongst them, particularly with a small clade formed by three genera from the Cretaceous of Montana: Zephyrosaurus schaffi, Orodromeus makelai, and Oryctodromeus cubicularis. 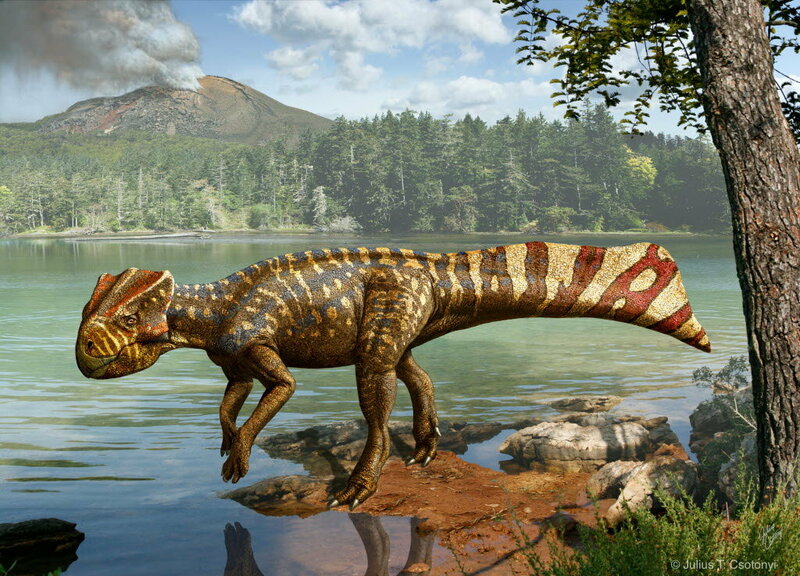 According to the morphological, phylogenetic, sedimentological, and taphonomic data at hand, it is tentatively postulated that Koreanosaurus was a burrowing dinosaur, like Oryctodromeus. Min Huh, Dae-Gil Lee, Jung-Kyun Kim, Jong-Deock Lim, Pascal Godefroit. 2011. "A new basal ornithopod dinosaur from the Upper Cretaceous of South Korea". Neues Jahrbuch für Geologie und Palaeontologie, Abhandlungen. 259 (1): 1–24. doi:10.1127/0077-7749/2010/0102. [Paleontology • 2011] Koreaceratops hwaseongensis • the First Ceratopsian dinosaur in the Korean peninsula — A Swimming Ceratopsian? 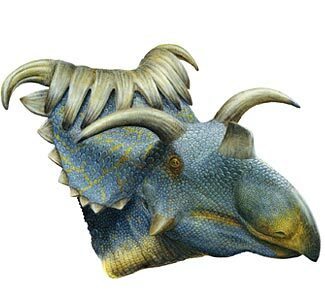 Koreaceratops is a combination of "Korea" and the Greek κερας/keras meaning 'horn' and οψις/opsis meaning 'face'. The type species is K. hwaseongensis, named after Hwaseong City. 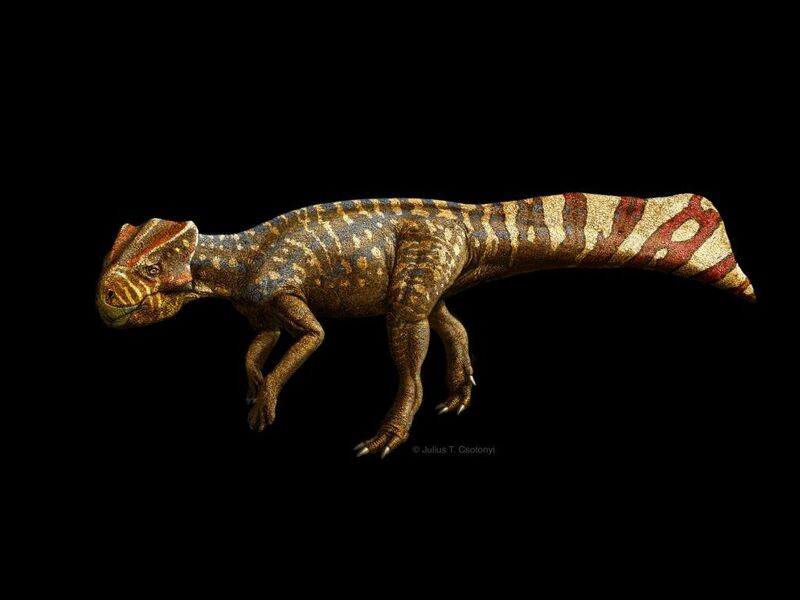 The remains of Koreaceratops - the tip of the tail is to the upper right and the partial legs are to the lower left. From Lee et al., 2011. In 2008, a new basal neoceratopsian was discovered in the Tando beds (Albian) of Tando Basin in SouthKorea. 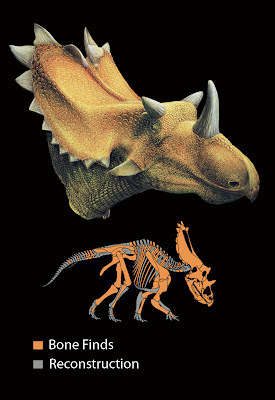 It represents the first ceratopsian dinosaur in the Korean peninsula and is assigned to Koreaceratops hwaseongensisgen. et sp. 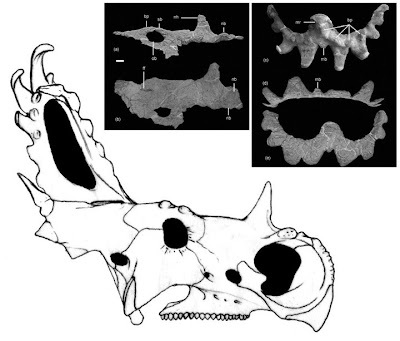 nov. Autapomorphies of Koreaceratops includevery tall neural spines over five times higher than the associated centra in the distal caudals, and a unique astragalus divided into two fossae by a prominent craniocaudal ridge on the proximal surface. 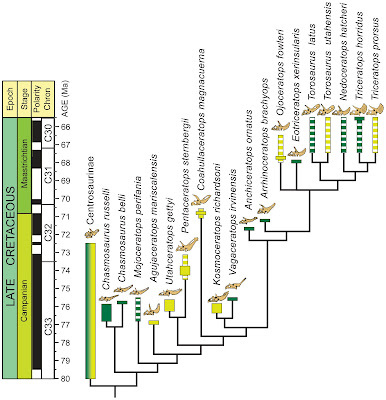 A phylogenetic analysis indicates that Koreaceratops is positioned between Archaeoceratops and all more derived neoceratopsians, and the elongation of caudal neural spines was an important derivedcharacter in non-ceratopsid neoceratopsians. The very tall caudal neural spines in Koreaceratops, Montanoceratops,Udanoceratops, Protoceratops, and Bagaceratops appear tobe homoplasious, suggesting an independent adaptation, possibly for swimming. Skeletal evidence suggests that obligate quadrupedalism occurred gradually in neoceratopsians progressing from bipedal through facultative quadrupedalism, to complete quadrupedalism in Coronosauria. Lee, Yuong-Nam; Ryan, Michael J.; and Kobayashi, Yoshitsugo. 2011. 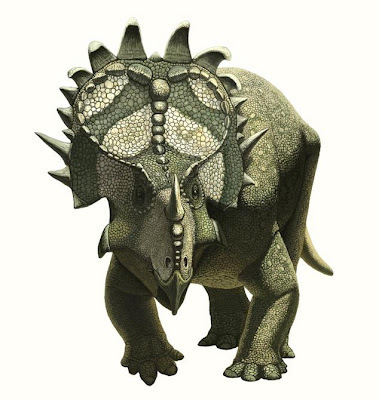 "The first ceratopsian dinosaur from South Korea". Naturwissenschaften. 98 (1): 39–49. Ceratopsid dinosaurs represent one of the best known dinosaur groups in the Late Cretaceous, and their unquestionable fossil records are exclusively restricted to western North America. 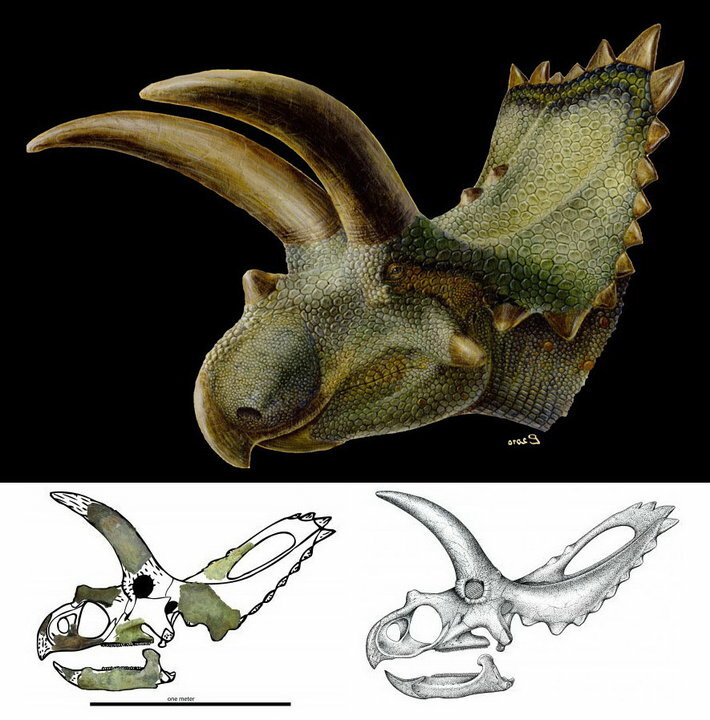 Here we report a new ceratopsid dinosaur, Sinoceratops zhuchengensis gen. et sp. nov., from the Upper Cretaceous Wangshi Group of Zhucheng, Shandong Province, China. Cladistic analysis places this new taxon as the only known ceratopsid from outside North America, in a basal position within the Centrosaurinae. It is con-siderably larger than most other centrosaurines but similar in size to basal chasmosaurines. 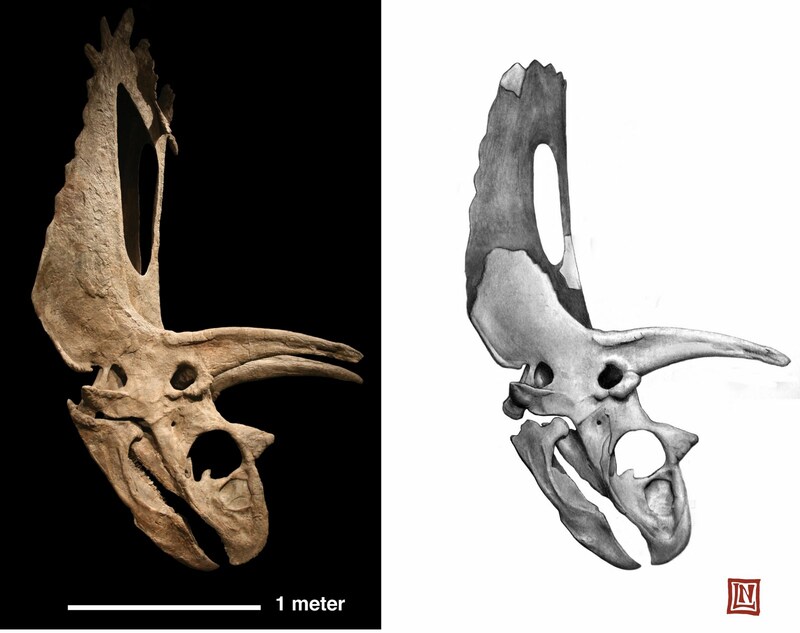 Furthermore, it is more similar to chasmosaurines than to other centrosaurines in several features, thus blurring the distinction of the two ceratopsid subgroups. 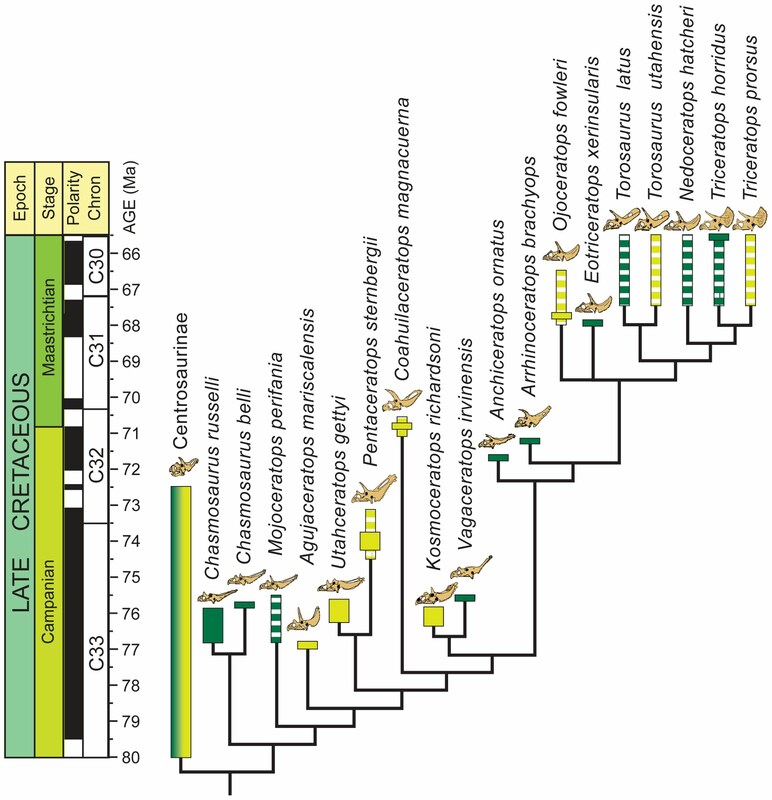 This new find not only provides significant information on the morphological transition from non-ceratopsid to ceratopsid dinosaurs, but also complicates the biogeography of the Ceratopsidae, and further demonstrates that fossil sampling has profound effects on recon-structing dinosaurian biogeography. Figure 1: Photograph of Sinoceratops zhuchengensis holotype. ZCDMV0010 skull in right lateral (a) and right laterodorsal (b) views; ZCDMV0010 parietals in dorsal (c), posterior (d), and ventral (e) views. Abbreviations: bp, bump; ff, frontal fontanelle; mb, median bump; mr, midline ramus;nb, nasal bump; nh, nasal horn; ob, orbit; pb, postorbital bump; sb, supraorbital bump. Scale bar = 8 cm for (a), (b) and 6 cm for (c), (d), and (e). Xu, X., Wang, K., Zhao, X. & Li, D. (2010). 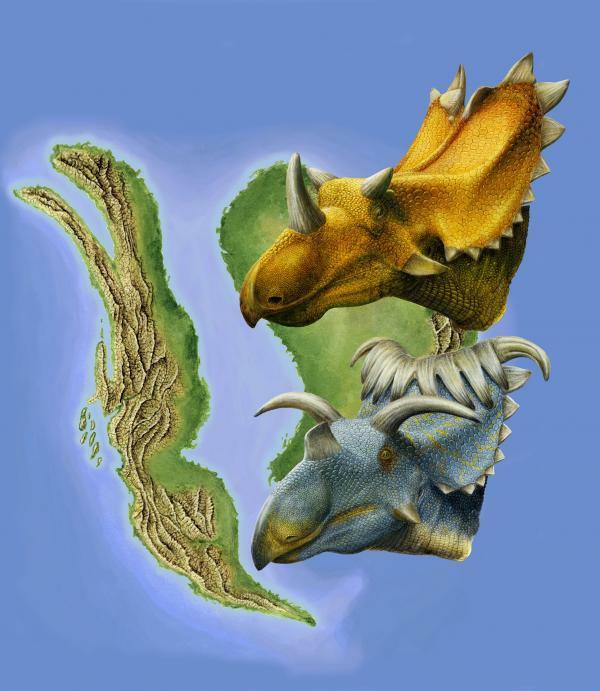 "First ceratopsid dinosaur from China and its biogeographical implications". Chinese Science Bulletin. 55(16): 1631–1635. DOI: 10.1007/s11434-009-3614-5. 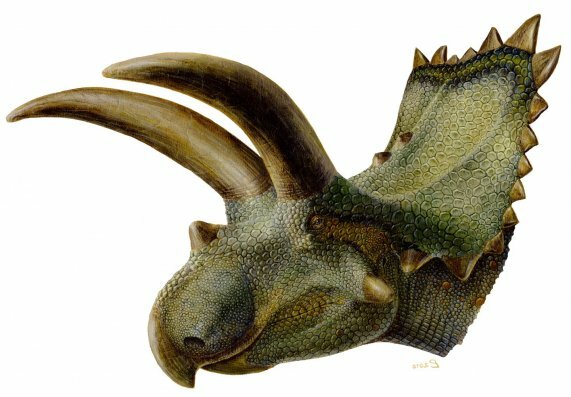 Coahuilaceratops magnacuerna, translates in part to "great horned horny face," and the dinosaur lives up to its description. The 72-million-year-old herbivore found in Mexico used its 4-foot-long horns mainly to attract mates. Loewen, M.A., Sampson, S.D., Lund, E.K., Farke, A.A., Aguillón-Martínez, M.C., de Leon, C.A., Rodríguez-de la Rosa, R.A., Getty, M.A., Eberth, D.A., 2010, "Horned Dinosaurs (Ornithischia: Ceratopsidae) from the Upper Cretaceous (Campanian) Cerro del Pueblo Formation, Coahuila, Mexico", In: Michael J. Ryan, Brenda J. Chinnery-Allgeier, and David A. Eberth (eds), New Perspectives on Horned Dinosaurs: The Royal Tyrrell Museum Ceratopsian Symposium, Indiana University Press, 656 pp. Nicholas R. Longrich. 2011. 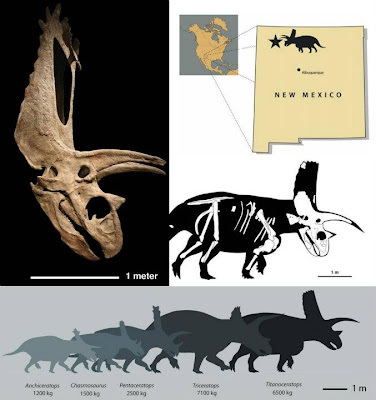 "Titanoceratops ouranos, a giant horned dinosaur from the Late Campanian of New Mexico". Cretaceous Research. 32 (3): 264–276. doi:10.1016/j.cretres.2010.12.007. 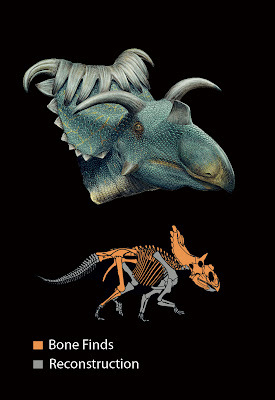 Artist's rendering of two new dinosaur species -- Utahceratops gettyi (top) and Kosmoceratops richardsoni -- discovered in the Grand Staircase-Escalante National Monument of southern Utah. 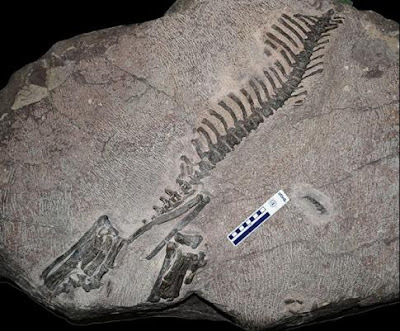 CREDIT: Courtesy of Utah Museum of Natural History. Scott D. Sampson, Mark A. Loewen, Andrew A. Farke, Eric M. Roberts, Catherine A. Forster, Joshua A. Smith, Alan L. Titus (2010). Stepanova, Anna. ed. "New Horned Dinosaurs from Utah Provide Evidence for Intracontinental Dinosaur Endemism". PLoS ONE. 5 (9): e12292 doi: 10.1371/journal.pone.0012292.